I had my first Pho soup at a Thai fusion restaurant years ago. For some reason, the town that I grew up in did not have a Vietnamese restaurant. It makes me sad because I fell in love with Pho right away, but it would be years before I tried any other Vietnamese dishes. The salads are my next favorite! If you haven’t eaten Vietnamese food, it’s time to start!! I realize that some people have never had Pho and I wanted to make something so you can taste this amazing dish!! Next, I want to discuss the Anise spice included in this recipe because it is something that my husband does not like. I cannot tell you how many times I’ve heard him say – I hate Anise or black licorice. This makes me sad, and I was determined to convince him that Pho was worth a try even with the vehement hatred of one of the ingredients. I am happy to report that he loved the soup even with the Anise flavor. As I explained to him, the flavors work together to create an absolutely perfect spiced broth that is like no other! Today, I made the Pho soup in the Instant Pot with the Stew setting of High Pressure set for 35 minutes. I’ve seen reports that people leave it longer, but I am all about the quick and easy meal! You don’t need the extra time. The chicken breast I used shredded beautifully at after 35 minutes and quick release of the pressure. If you are using a tougher meat like an inexpensive beef cut or oxtail, you will probably need to let it go longer to break up the toughness. We are trying to eat less beef, so the chicken was a natural choice for this Pho Recipe. The Instant Pot is one of my kitchen devices and part of my Ultimate Kitchen Tool and Equipment Buying Guide. Another note that I want to point out is that you can either keep the spices contained in a tea infusing ball or you can add them straight in like I did and used a cheesecloth to strain them out later. Pho broth is pretty clear and that usually because it’s been strained. I like the idea of the tea-infused mesh ball, but I haven’t bought one yet. I have one in my Amazon cart and dying to order it for the next time I want to make a Chicken Pho Recipe. Place the chicken breast, coriander seed, ginger, garlic, Thai basil, cloves, anise seed, pepper, salt, scallions, and chicken broth into the instant pot and cook for 35 minutes on high pressure. While it is cooking, let the rice stick noodles soak in water. 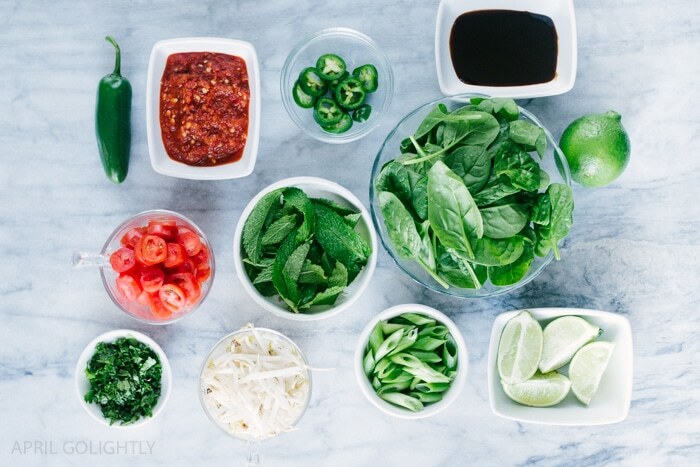 Cut the cherry tomatoes into halves, slice rounds of the jalapeños, slice a lime into wedges, pluck the mint off the stems, wash the bean sprouts and spinach, and dice the cilantro. Let the pressure out using quick release at the end of 35 minutes. Strain the broth using cheesecloth. Take the chicken out and shred it with forks. Add the chicken back into the strained broth. Add 1 tbsp of fish sauce into broth and mix. Ladle the soup into large bowls. Then, insert the noodles, spinach, tomatoes, cilantro, bean sprouts, jalapeños, and a small dash of Sriracha or hoisin to your liking. Remember, the more Sriracha you add, the hotter it will be! Then finish with a squeeze of lime juice from a lime wedge. 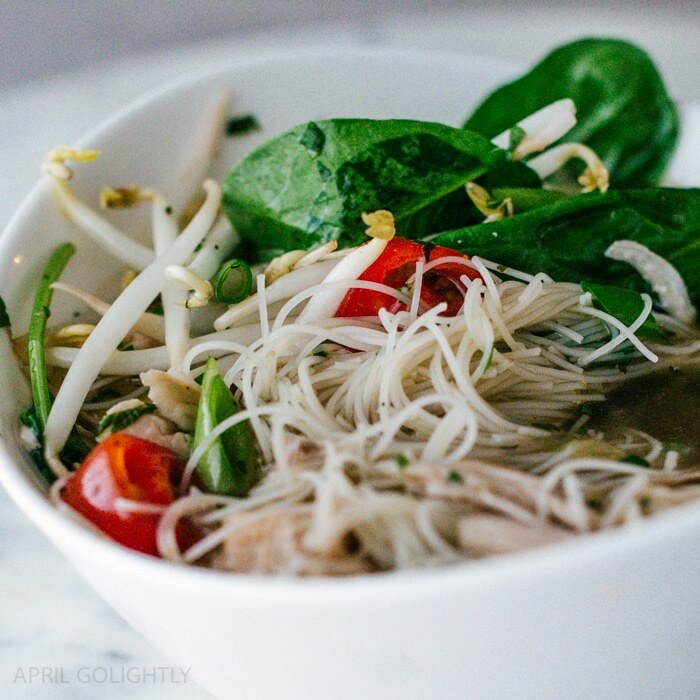 To make this Pho paleo and Whole 30 friendly, use paleo approved chicken broth or make your own at home. Also, swap the noodles out for zucchini noodles and swap the regular sriracha out for a paleo sriracha like this one. Sharing is Caring – Please Pin this Instant Pot Chicken Pho Recipe! To make this Paleo Pho and Whole 30 friendly, use paleo approved chicken broth or make your own at home. Also, swap the noodles out for zucchini noodles and swap the regular sriracha out for a paleo sriracha like this one. You can learn all about how to eat paleo here. This sounds great, but you say in the directions to add fish sauce, but it’s not mentioned in the ingredients list. How much fish sauce? It was not listed with the ingredients. This looks so tasty. Dying to try the paleo version of it with no noodles. This looks so tasty. Dying to try the paleo version of it with no noodles. Thanks for sharing the pointers. In the ingredients list, you don’t have how much Thai basil you put into the broth, or how much fish sauce to add after.